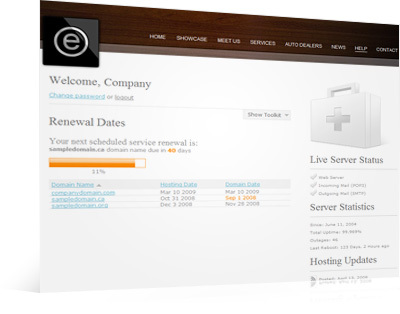 E Media Architects » Blog Archive » Need Technical Assistance? Get Help Here. Need Technical Assistance? Get Help Here. Do you need help with your E-mail or Web site? Do you need simple information and straightforward online tools to help you manage a variety of related tasks? We can help you right now! We have custom-created a toolkit especially for our clients. Access it by visiting emediaarchitects.com/help. The following tools are freely available to anyone, except where a login is indicated. However, the solutions offered are only applicable to persons within organizations that are currently our clients. These step-by-step video tutorials will show you how to configure an E-mail account to send and receive on a local computer. Just select the application you will be using and follow the instructions. Need help fast? This self-serve knowledge database features concise solutions to over twenty problems which our customers have presented to us, pertaining to using E-mail and accessing your Web site. This icon provides a shortcut to access your E-mail account from any Internet-connected computer. You will need to know your complete E-mail account name and password in order to log in. Send us large files or multiple files at once using our file up-loader. This tool may be accessed by your organization’s administrative representatives using the usual EMA account login, or contact us to obtain a login for this particular service. As a fast alternative to sending a cheque, you may instantly pay any invoice online via PayPal.com using a credit card or PayPal account. Please note that a surcharge will be applied to cover the costs of online payment processing. View a complete list of all recurring services which you have registered through us, along with their renewal dates. This tool may be accessed by your organization’s administrative representatives using the usual EMA account login. View your sites’ recorded traffic, make comparisons and learn which keywords visitors use when searching for your site. This tool may be accessed by your organization’s administrative representatives using the usual EMA account login. Chat with us during business hours without installing any software on your computer. This tool may be accessed by your organization’s administrative representatives using the usual EMA account login. As before, if you have an emergency situation during times when our office is closed, you may use this form to contact us. This tool may be accessed by your organization’s administrative representatives using the usual EMA account login. Forgot your EMA account login? Tools which involve individualized information require a login. In such cases, you will need to use your existing EMA account login information. If you have forgotten your login, simply click any password-protected tool or the login link in the footer of any page on our site, then click the Forgot password link to have your login E-mailed to you. Do you have any opinions or suggestions on our Help toolkit? What do you think of the quality of the information or the layout and ease-of-use of the pages? What other features or tools would you like to see added in the future? Please comment and let us know.